The Deputy Vice Chancellor of Nnamdi Azikiwe University, UNIZIK in Anambra state and his wife, have just welcomed a set of quadruplets after many years of waiting. Prof. Charles Esimone and wife, welcomed their first child, a boy in 2015 after waiting for 12 years. 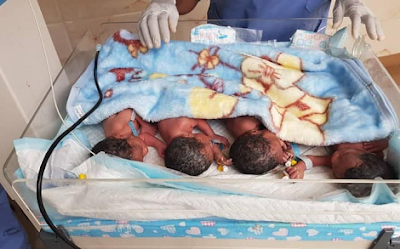 Fast forward to March 26th, 2019 the couple have again welcomed a set of quadruplets -- two boys and two girls. We say big congrats to the couple. People who think they can’t have any child now have FIVE!! Good God!! !